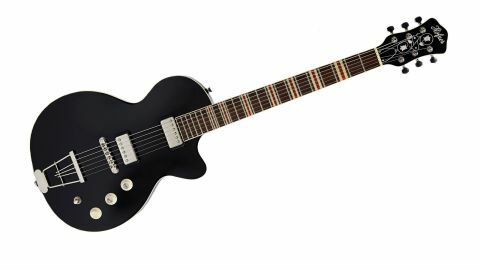 What Höfner is offering with the Contemporary Series Club Solid is an aristocratic guitar at a price we bums can afford. Sorry, Mr Lebowski - we won after all. Sophisticated looks. Comfortable neck. Big rock, jazz and blues tones. Great value for money. While the Höfner Club Solid's evolution through the 60s and 70s was inspired by the success of Gibson's market-leading single cut, it's ironic that now, 50-odd years and innumerate LP knock-offs later, Höfner's electric feels like an alternative with a charm of its own. "It's built for sustain, and has a treacle-thick tone and solid mahogany body"
The Club Solid feels equally weighty with a very similar, slightly longer scale (24.7 as opposed to the Gibson-favoured 24.5 inches), while the fact that it's built for sustain, and has a treacle-thick tone and solid mahogany body (capped spruce) will appeal to a similar demographic. But with its elegant, gentlemanly trapeze tailpiece, more rounded silhouette and the floral detail in the headstock, the Club Solid looks more like an older relative - a sophisticated throwback to a more civilised age. The thick, comfortable maple neck is glued onto the body, and while the clunky heel will chase away some of those who call the upper-fret range home, the stability the joint lends to the guitar is more than sufficient recompense. This is a big-boned, big-toned guitar. Its two Höfner Diamond Nickel humbuckers are adequately powered for rock, bright enough in the bridge and rich and bassy in the neck, yet dialling the gain back leaves a wealth of subtlety for jazz and blues players to exploit.